SOMP Totes are wonderfully versatile bags that are just the right size for a trip to the library, a lunch date, or carrying around your little one's most essential gear for an afternoon out. 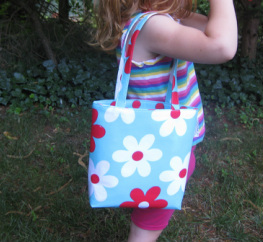 SOMP Totes are best-sellers for obvious reasons: totally functional, clearly decorative. SOMP Totes come in small, medium, large, and XL (see dimensions below), and are customizable: snap flaps, extra long straps, pocket size / quantity / style, and fabric selection. SOMP straps and points of pressure are triple stitched. Fabrics are very high quality and are reinforced for extra body and strength. SOMP totes will keep their shape nicely, and can be easily refreshed with a hot iron and some steam. This is my own design. I make bags in extremely limited editions: I love fabric, but I get bored fast so I buy only a limited quantity of each print. This means your bag will be unique! If you're going to pay some bucks for a purse, it may as well be for one that is truly only yours. I recommend hand washing to prolong the life of your SOMP bag. That said, SOMP bags will stand up to a trip through the washer on cool. Line dry only; reshape with medium iron. *shown here with adjustable snap flap, which is available for an extra charge.